(CNN) -- Faced with a projected $42 billion deficit, California Gov. Arnold Schwarzenegger says his office will send out 20,000 layoff notices Tuesday if lawmakers fail to reach a budget deal before then, according to a spokesman. Gov. Arnold Schwarzenegger warned lawmakers about potential job cuts last week. He warned lawmakers about the cuts last week, urging them to approve the latest budget proposal. However, voting was stalled during a 30-hour weekend session as the legislature mulled over 26 pieces of legislation that make up the budget package. By Monday night, there was still no vote on the floor, and the State Assembly in Sacramento was not in session as night fell. Some Republican lawmakers, including state Sen. Abel Maldonado, R-Santa Maria, say they don't agree with the $14.4 billion in tax increases tied into the budget package. "People don't realize where California is at -- people are losing homes, people are losing jobs," Maldonado told CNN affiliate KOVR. "We are in a fiscal emergency, and we need to come together to (resolve) it." The cuts, if they happen, wouldn't begin until the start of the fiscal year on July 1, starting with employees of least seniority, McLear said. The cuts would save California $750 million for the year. McLear added that state workers are under contract, meaning layoffs would be a slow process. 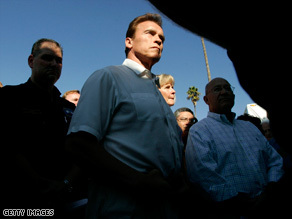 Schwarzenegger and lawmakers have tried discussing alternatives to avoid the scenario. "The real-life impact will be the slowdown -- the actual shutdown -- of hundreds of state funded transportation projects, people not getting paid, taxpayers not getting refunds," said Senate President Pro Tem Darrell Steinberg, D-Sacramento.